1. Research what features will yield a good ROI. Potential buyers will look for the same features in homes in one neighborhood. For example, if all homes have granite countertops and side-by-side refrigerators, then you need to install those, too. However, if nearby homes have laminate countertops and regular top freezer refrigerators, then installing luxury features isn’t likely to get you a good ROI. Never, ever, do a kitchen remodel on the fly. Have a well thought-out plan and make sure your contractors are ready to start on the agreed date. In addition, you’re best advised to purchase all your materials and appliances ahead of time to avoid delays that can cost you time and money. 3. Avoid changes to the floor plan that require plumbing and electric overhauls. If you relocate appliances, sinks, or even the entire kitchen, you’ll have to relocate the plumbing and electric—and that’s expensive. If you can use the existing plumbing and electric systems, do so. 4. Save on appliances by purchasing floor models or lightly damaged appliances. Kitchen showrooms often sell marked down floor models or appliances that have small scratches, dings, or dents. This is a great way to obtain expensive brands at a considerably lower price. Some of our investors are finding good value at Sears Outlet, Brandsmart and HomeDepot. 5. Save on kitchen cabinets. The color and style of a kitchen’s cabinets contribute significantly to its overall appeal. Fortunately, you can easily give outdated, ugly, or damaged cabinets a facelift by replacing the doors with more stylish ones. Give the inside of the cabinets a lick of paint, and they’ll be as good as new. 6. Shop around for deals. To get great deals on floor and wall tiles, look for companies that sell odd lots and clearance deals. There are likely to be one or two in your area. In addition, there are a number of reliable ones online—just keep in mind that shipping and handling can add up, so always do the math before ordering from them. Reclaimed materials can include everything from solid wood kitchen cabinets and ceramic floor tiles to kitchen furniture and unique lighting fixtures. However, bear in mind that finding the right sizes or amounts can be challenging, so take the time to do your research before you start the budget kitchen remodel. With these tips in mind, you’ll soon learn to keep kitchen remodeling costs as low as possible. And if you can make an inexpensive kitchen remodel look like it belongs on the pages of Architectural Digest, then your project is almost certain to be a winner! 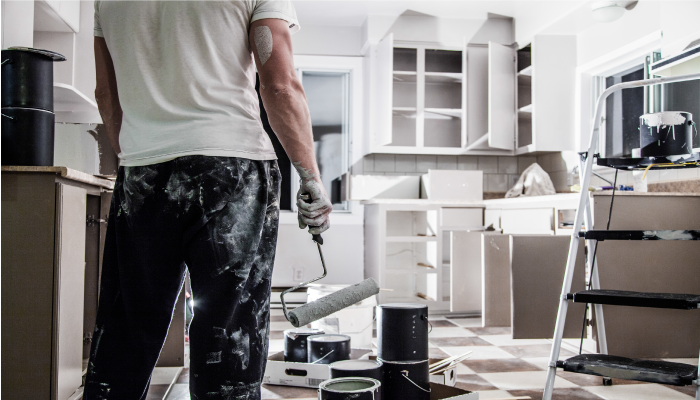 If you are looking to rehab an investment property, apply for one of LendingOne’s Fix-n-Flip Loans and you could receive up to 90% of the purchase and repair costs.